Click on the logo to return to this page. Fenny Stratford's history owes much to the Roman occupation of Britain and crucially to a Roman military route of the mid 1st century A.D. that was later to become known as Watling Street, north from London, the modern A5. Much of this road north from the Thames, perhaps from St. Albans, seems to follow the advance of the XIVth Legion which by the late 50's A.D. had established a fortress base at Wroxeter, spawning camps and settlements along the way. 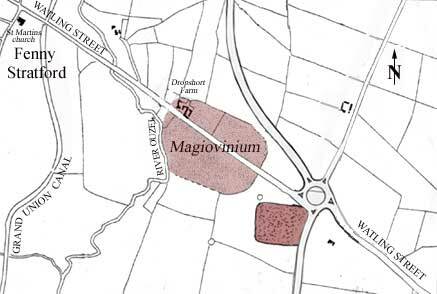 Magiovinium, a Roman small defended town straddling Watling Street, close to Fenny Stratford and the river Ouzel, probably succeeded a small auxiliary fort of this early Roman phase. Map showing relationship of Fenny Stratford to Magiovinium and (darker shaded area) probably early Roman Fort. Based on a original by Hedley Pengelly FSA and updated to include the A5 (Watling Street) diversion. Continue..